Boys & Girls Club of Dane County is proud to partner with the Madison Metropolitan School District on the AVID/TOPS initiatives. Consisting of both classroom (AVID) and real-world (TOPS) components, AVID/TOPS focuses on preparing high school students for college while working to make college more affordable for those students. 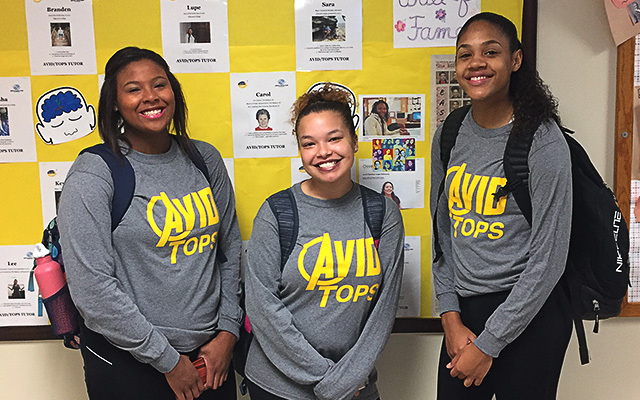 AVID/TOPS is modeled after two successful initiatives that produce college enrollment rates of more than 95 percent. A bachelor’s degree and an open heart is all you need to become a mentor/tutor for AVID/TOPS students. As a mentor, you are both a friend and a counselor, there to listen and share your life experiences, to offer advice and provide guidance when necessary. Mentors act as the role models our students need to overcome the challenges of high school and prepare for the college experience. Developing career aspirations greatly increases the likelihood that a student will earn a college degree—that’s why summer internships are so important for AVID/TOPS students. By providing a paid summer internship for a high school junior or senior, your business/organization has the ability to open up a world of professional opportunity for underexposed youth.